Biafra, the land of the Rising Sun. (Obodo Chukwu Telu Mmanu)- 'The land that flows with milk and honey'. A race that had no army, police, or navy, yet lived in peace and harmony with each other. Our belief says “Live and let’s live". We hate monarchy and dictatorship of any nature, because we believe in freedom, and that all men are created equal. We are a loving people. Biafrans are republican in nature. A race that is accommodating and lives in harmony with their neighbors, they call us a dominating race because of our highly successful nature, and way of life. We believe in the equality of humanity. The chiefs (criminals) you see today are the institutions of the British government to divide and rule Biafrans. We never had chiefs or kings, therefore we can’t live under a dictator and terrorist like Muhammadu Buhari, the tyrant of the Islamic caliphate of British Royal Niger Company called Nigeria. Biafrans loves freedom because we are republicans in nature. This is why we have autonomous communities and create more as days go by. When a Biafran is living with his parents and he feels it is time to alone in freedom and carter for himself, the parents let go of him because we do not hold anyone against their wish. Therefore, I see no reason why the Islamic caliphate of northern oligarchy called Nigeria, have persisted in holding down Biafrans and destroying our various shops, and at the same time killing and arresting us unjustly. This is inarguably a crime against humanity. 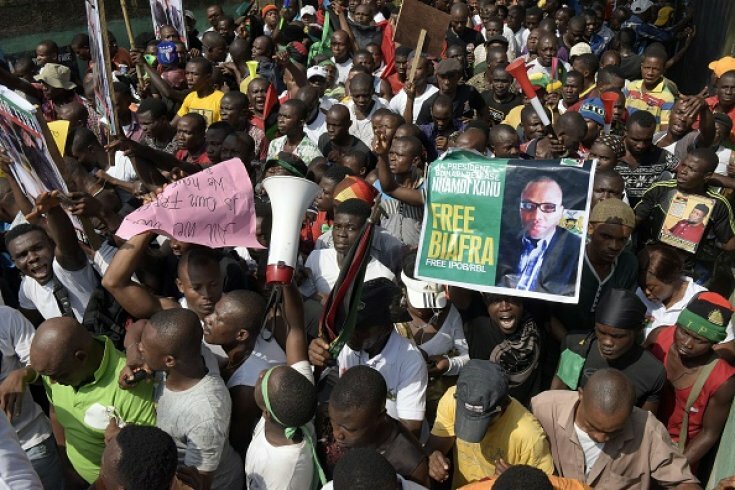 Biafrans are saying no to dictatorship and tyranny in Nigeria. You cannot force your religion upon the indigenous people of Biafra (IPOB), the children of light. The beacon of hope of the black world, the Nigerian government must stop terrorizing our people. Why the contraption called Nigeria afraid of the freedom and restoration of Biafra? Why is self determination a treasonable felony in the contraption called Nigeria? What is the western world afraid of when they hear about the emergence of the blessed nation of Biafra? Is self-determination a crime? Why force a people against their wish? Is the emergence of the sovereign state of Biafra a threat to the western world? Is UN Charter for self-determination a fraud? Is freedom a crime? Forcing a people against their wish is “Modern Slavery” as much as killing with impunity. Biafra restoration represents righteousness, love, peace, equity, harmony, light, truth, unity, freedom and many other good things. Biafrans are scattered all over the world, while many were taken into slavery by the institutions imposed on through the so called elders- Ohaneze Ndi Oshi. Many have lost their identity and their roots. Many of Biafrans have no place to call their home, because the society in which they live in hate them as a result of the blessings CHUKWU OKIKE ABIAMA (the supreme creator of the universe) has bestowed upon Biafrans. Biafra is here to restore the kingdom of CHUKWU OKIKE ABIAMA on earth and to gather her offsprings scattered all over the world to come back home because there is no place like home. The restoration of the blessed nation of Biafra is sacrosanct (inevitable). It cannot be destroyed by anyone born of woman. The oppressor does not give freedom. Freedom is taken by the oppressed. As the Holy Book puts it in phrase, “The kingdom of Chukwu Okike Abiama suffers violence but only the violent ones takes it by force”. As our leader and mentor always used to say “They will kill us, they will maim us, but at the end we win and Biafra will come”. Yes they have been killing us so often a time, but that doesn’t mean we will continue to fold our hands and watch these blood suckers (vampires) to keep on killing the children of light. Nobody has the monopoly of violence. The subjugation of the indigenous people of Biafra (IPOB) in the evil contraption called Nigeria can no longer be condoned. Freedom of Biafra is freedom of black race. #FreeNnamdi_Kanu, a prisoner of conscience.